Conversely, an unhealthy dog can be become unhappy, depressed or even uncharacteristically aggressive. When you think about it, it makes complete sense – when we are in pain, we experience some of those same emotions and feelings. Unfortunately it is all too common that when a dog is in pain, owners are convinced they actually have an intentionally nasty dog. By assuming a dog is having behavioural problems before checking out whether a dog is in pain, you can make the problem much worse, and in many cases, aggravate the injury or medical problem. If you have a dog that is in pain, then as they feel that pain, they can lash out. It’s a perfectly natural instinct to do so. 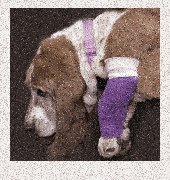 This can happen especially when someone is using harsh methods of handling, jerking their dog on lead or trying to forcibly move a dog by their collar. The problem with these techniques is that the more you yank, pull, jerk or force your dog around, the more pain they are in, and the more aggressive they get. The unfortunate side-effect of the ‘dominance’ theory and the forceful methods that are often utilised means that as the dog gets more aggressive, the handler can often assume that the dog is becoming more ‘dominant’ over them. Consequently, the more ‘dominant’ they think the dog is being, the more physical they get, and the more aggressive the dog becomes due to the increased pain. It’s a cycle that will not end well. If they’re in pain, aggression can be symptomatic of an underlying medical issue. Exactly how does a ‘dog in pain’ look? Some dogs act like big wimps, whimpering if they step on a bramble and others wouldn’t let you know they were in excruciating agony.